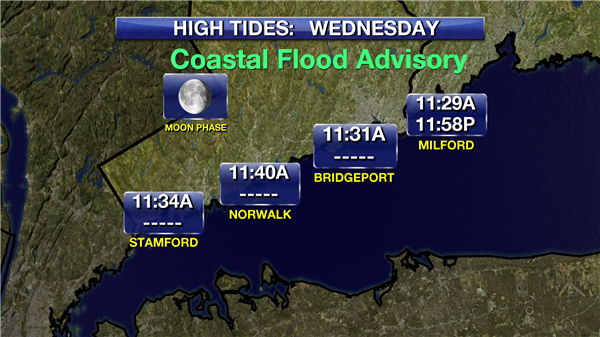 A Coastal Flood Advisory is in effect during high tide tonight. Tides will be a half a foot above normal. Minor inundation is possible. WEATHER UPDATE: Heavy rain and storms are on the way tonight. 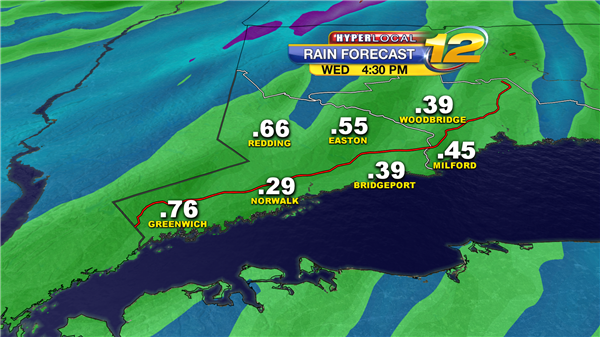 Ahead of a cold front we'll see rain arriving around midnight. There will be a chance that storms may produce damaging winds and lightning. The highest chance of severe weather will be just to our north and east. 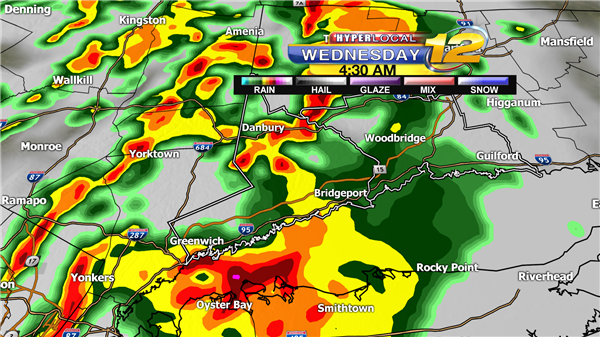 Most likely we'll see brief torrential rain and frequent lightning during the early morning hours. 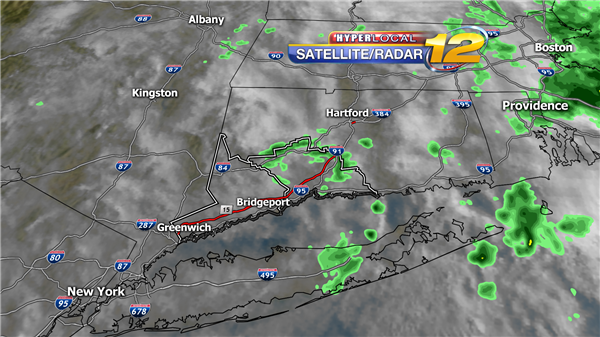 The storms look to move out of Southwestern CT around sunrise with clearing skies and breezy winds. Wednesday will be mild and sunny with highs reaching near 73 degrees. This is what one high resolution computer model shows for rain coverage in our area. 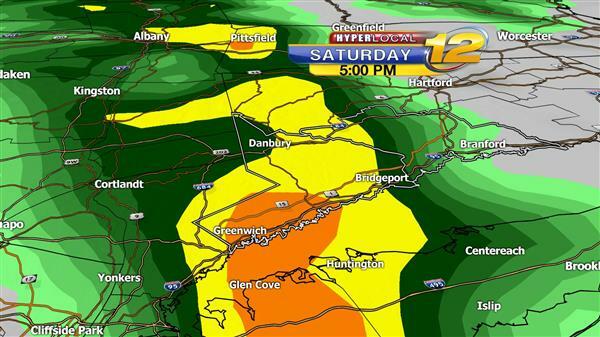 Yellow and orange indicates heavy rain. Red shows the potential of storms. Stay with News 12 for updates. 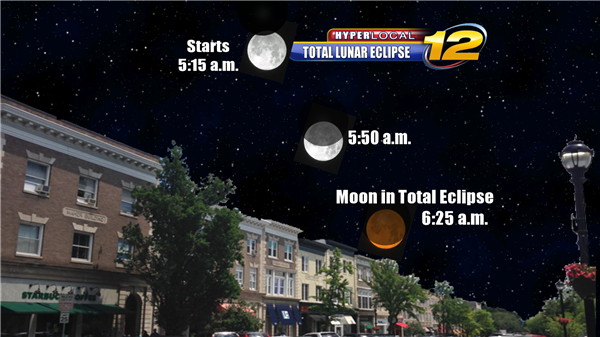 We're keeping our fingers crossed that the rain and clouds clear in time for at least part of the lunar eclipse Wednesday morning. Here's a look at the timing of the eclipse. A few showers are expected early this morning. 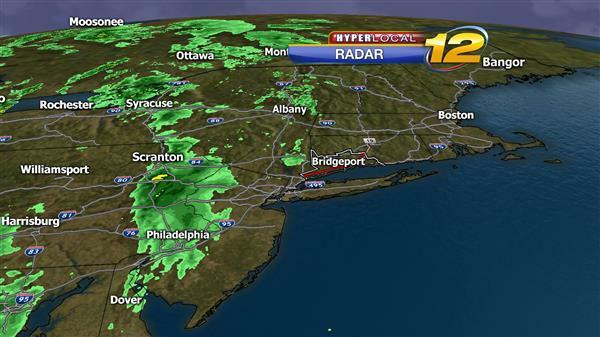 Here is the latest radar. Skies are mostly cloudy, but it is much milder this morning with temperatures in the lower 60s across the shoreline and upper 50s inland. A few showers are expected this morning, but some sunshine will return this afternoon. A cold front will bring rain and a possible thunderstorm tonight, bringing much cooler air to the region. Today will be mostly cloudy and milder with a few early showers and a high temperature in the lower 70s. Tonight will be breezy with rain and a possible thunderstorm and a low of 57 to 61 degrees. Tomorrow will feature an early shower or two, followed by gradual clearing and a high of 72. Thursday will be partly to mostly sunny and cooler with a high of 65 and a low of 51. Friday will be cloudy with rain developing during the afternoon with a high of 62 and a low of 48. Saturday brings early showers followed by clearing skies with a high of 63 and a low of 52. Sunday will be mostly sunny and pleasant with a high of 66 and a low of 50. 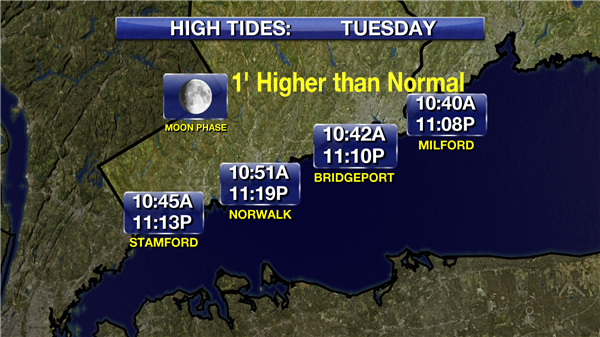 Minor coastal flooding will be possible during high tide times Tuesday. Water levels will be a foot above normal and may cause brief inundation on shore roads and nearby properties. A clear sky and chilly temperatures are in the forecast for tonight as fair weather takes us into our next work and school week for Fairfield and New Haven counties. Temperatures will increase to the mid-60s and low 70s by Tuesday and Wednesday, unfortunately, we will pay for it with clouds and showers. 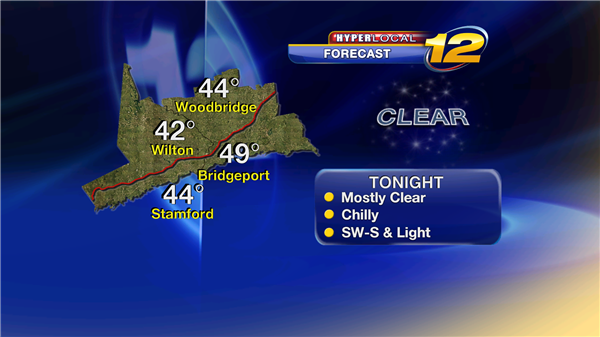 Tonight: A mostly clear sky and chilly with lows from the low to upper 40s. Monday: Mostly sunny early followed by a mix of sun and clouds by the afternoon hours with highs from the mid to upper 60s. Monday Night: Increasing clouds with a chance of a few spotty showers and lows from the mid-50s to low 60s. Tuesday: Mostly cloudy with a slight chance of showers, highs from the mid-60s to low 70s. Tuesday Night: Mostly cloudy with a chance of showers and possible thunderstorms, lows from the mid-50s to low 60s. Wednesday: Morning clouds and showers flowed by partial afternoon clearing, highs from the mid-60s to low 70s. Wednesday Night: Mostly clear and cool with lows from the low to mid-50s. 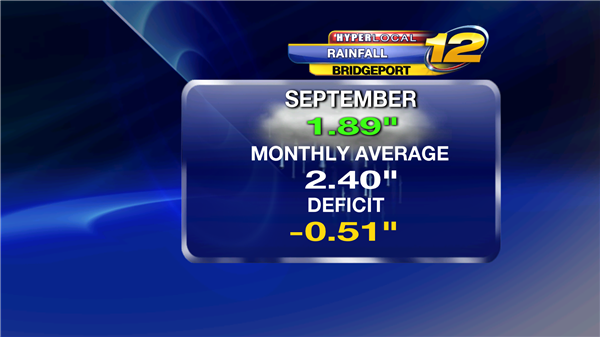 Saturday, October 4, marks the 27th anniversary of the earliest measured snow on record at Bridgeport. 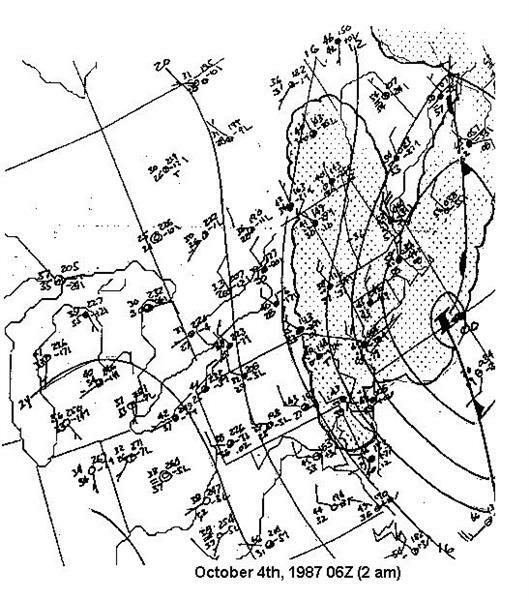 A half-inch fell Sunday, October 4, 1987. 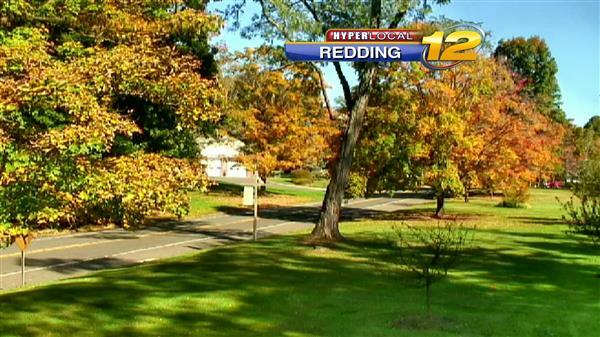 It's sunny, cool, and crisp in Redding this morning. The sky is crystal clear & it's 57 degrees. Fall is in the air. Saturday afternoon is not looking too nice. 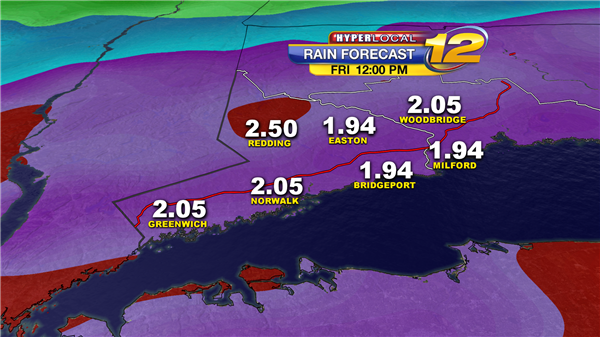 Heavier rain and a possible thunderstorm arrives later in the day. Here is the forecast map at 5 p.m.
A pleasant early-Fall day is ahead under plenty of sunshine and seasonably cool temperatures. However, rain is expected Saturday as a slow-moving front moves across the region. Sunday will be the better of the two weekend days, although it will be breezy and cooler. Skies are clear and temperatures are in the lower 50s early this morning. You'll certainly need a jacket or sweater when you leave the house. Today will be mostly sunny and pleasant with a high in the upper 60s to close to 70 degrees. Tonight will become mostly cloudy with a shower possible late and a low in the 50s. Tomorrow will be cloudy and breezy with rain developing late-morning through the afternoon. There is a slight chance of a thunderstorm with a high of 70. Sunday will be mostly sunny, breezy, and cooler with a high of 66 and a low of 51. Fair weather is expected Monday and Tuesday before showers arrive by the middle of next week. 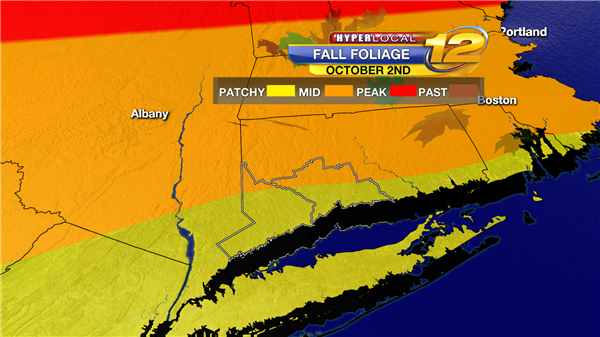 Fall colors are mid way to peak in northern Fairfield and New Haven counties and north. Sunday looks to be the best day for leaf peeping this weekend. After some rain this morning, activity has tapered off but clouds remain. Scattered light rain and drizzle will continue through early tomorrow. Patchy dense fog may develop overnight with lows in the mid 50s. Winds will be breezy tomorrow with highs reaching the mid 60s. Another cloudy and damp day is ahead, but it will be cooler than the last couple of days. Temperatures are currently in the middle 60s with a few rain showers moving away to the East. Today will be mostly cloudy with a few isolated showers or sprinkles and a high temperature near 70 degrees. 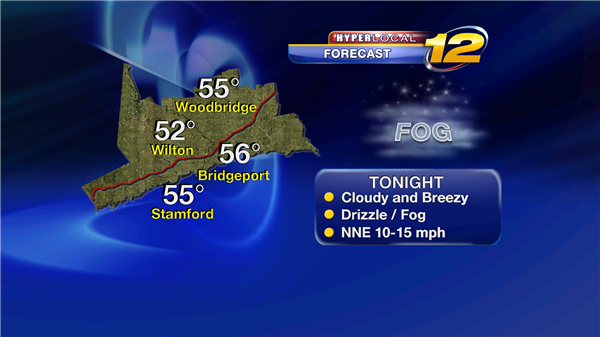 Tonight will be cloudy with a shower or sprinkles and patchy fog with a low in the 50s. Tomorrow will be mostly cloudy with isolated showers and a high in the upper 60s. Fair weather returns Thursday and Friday with daytime highs near 70 Thursday and in the lolwer 70s Friday. A cold front will bring showers Saturday and cooler air by the end of the weekend. Another mild day is ahead, but clouds will mix with the sun today. Currently, skies are partly cloudy and temperatures range from the upper 50s to middle 60s along the immediate coast. A storm system will be far enough to the south later this week and will keep rain away, but there is a threat of an isolated shower or two through the middle of the week. 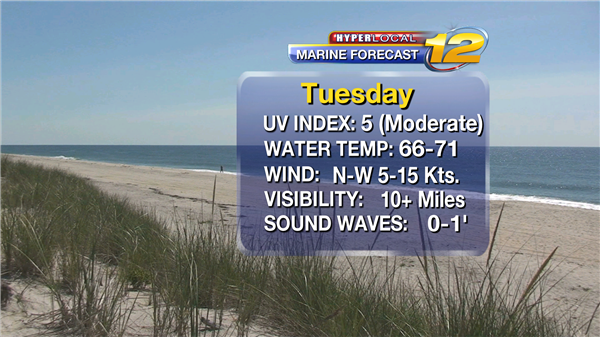 Today will be partly sunny and mild with a high temperature of 76 degrees. Tonight will be mostly cloudy with lows near 60. 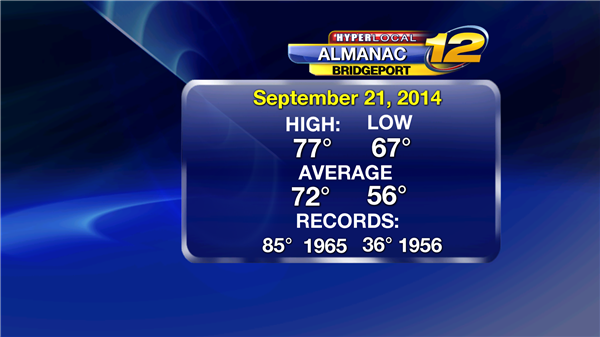 Tomorrow will be mostly cloudy and cooler with a high of 71. 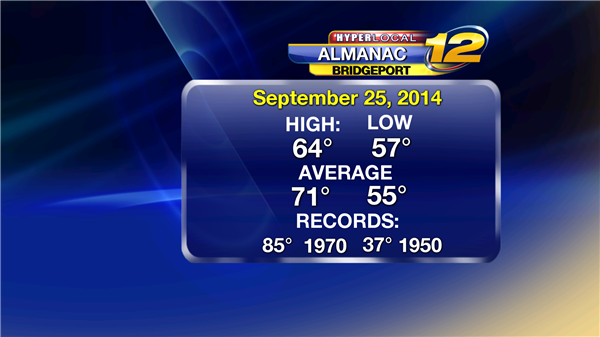 Wednesday will be mostly cloudy with a spot shower or two and a high of 69 off a low of 58. Thursday and Friday will feature a mix of sun and clouds with daytime highs in the upper 60s and nighttime lows in the upper 50s. Saturday will be cloudy with showers and a high of 69. Clear skies and sunny, dry weather is expected this weekend. Take a look at the forecast data for the next two days. It looks absolutely beautiful. A beautiful Summer-like weekend is ahead under mostly sunny skies and high temperatures in the upper 70s to close to 80 degrees. 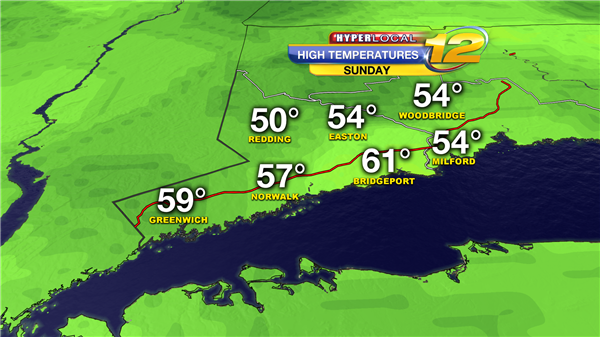 Here is the Sunday morning forecast map. The steady light to moderate rain will begin to taper off overnight as high pressure displaces the weak, coastal low pressure system that is moving up the Atlantic coast. We transition back to a pleasant weather pattern overnight through Friday. Tonight: Showers ending late followed by partial clearing into the early morning hours of Friday, lows from the low to mid-50s. Friday: Breezy with a mix of sun and clouds, highs from the upper 60s to the mid-70s. Friday Night: Mostly clear and cool, lows from the mid-50s to upper 50s. 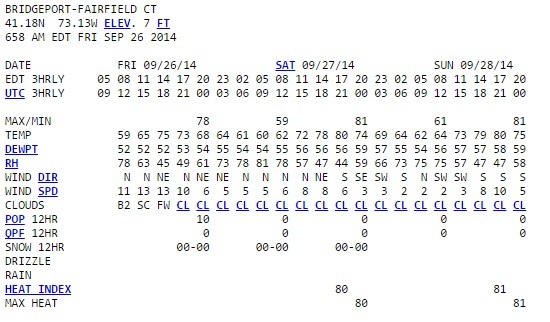 Saturday: Mostly sunny, high from the mid-70s to low 80s. Saturday Night: Mostly clear and cool, lows from the mid to upper 50s. Sunday: Mostly Sunny, highs from the mid-70s to low 80s. Sunday Night: Mostly clear, lows from the mid-50s to low 60s. 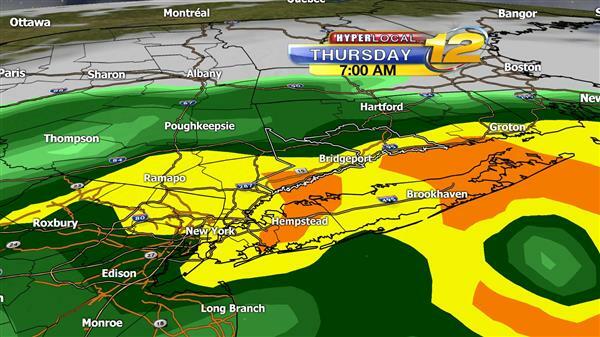 Thursday morning's commute will be rainy and windy. You may want to leave earlier than normal. Moderate to possibly heavy rain is expected through the morning rush. We'll enjoy one more nice day before we get a good soaking tomorrow as a storm system moves North along the Atlantic coast. Currently, skies are clear and temperatures are in the upper 40s to lower 50s. Today will feature sunshine followed by increasing afternoon clouds with a high temperature close to 70 degrees. Tonight will become mostly cloudy and breezy with rain developing late and a low in the 50s. Tomorrow will be cloudy and windy with periods of rain, moderate to heavy at times, with a high only in the middle 60s. Friday will become partly sunny and breezy with a high of 73 and a low of 53. 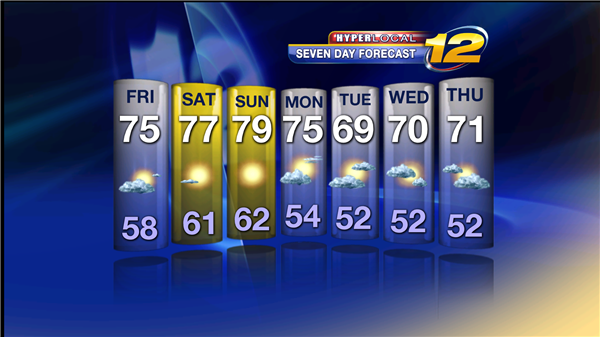 The weekend looks nice with mostly sunny skies and high temperatures in the mid 70s to close to 80 degrees. Here's what one computer model is forecasting for rain between early Thursday and noon on Friday. That could cause some minor flooding. Skies are clear & blue across our area today. But to our south there's widespread clouds and rain. 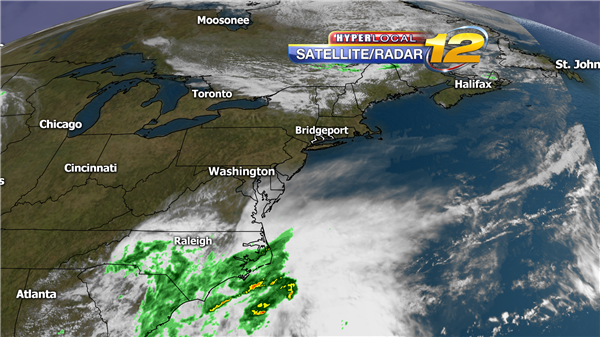 That is a low pressure system that may develop into a coastal storm over the next couple of days. It will move northeast and may be close enough to bring rain to us on Thursday. We'll keep watching the models to see if there's any change in the forecasted track of the rain. 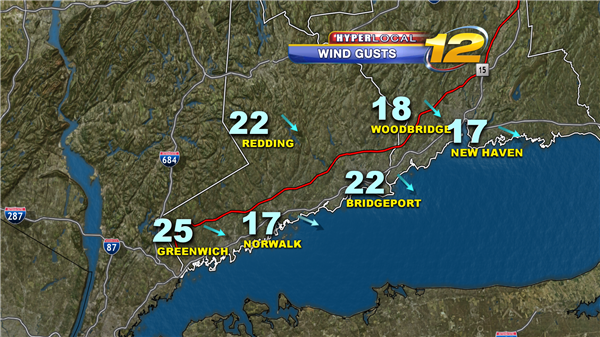 Winds will relax tonight but still quite breezy behind this morning's cold front. Cool temperatures continue in the Northeast, and that is great news for the foliage! The number one influence on the Fall foliage is the amount of daylight. As the amount of daylight dwindles, a signal is sent to the deciduous trees (trees that shed their leaves during the Winter) that Winter is approaching. Much of northern New England is now in the low color (11% - 30% change) category. The same holds true for the higher elevations of New York's Adirondack Mountains and Catskill Mountains. Elsewhere in the region, some color is being reported, but below 10% change. A relatively quiet week of weather is ahead before temperatures rebound well into the 70s Friday and close to 80 degrees Saturday. Here is the Friday morning forecast map. A beautiful week of weather is ahead as high pressure will deliver mostly sunny skies and comfortable levels of humidity. Fall officially arrives at 10:29 p.m. today with the Autumnal Equinox. Skies are mostly clear with temperatures in the upper 50s to lower 60s early this morning. 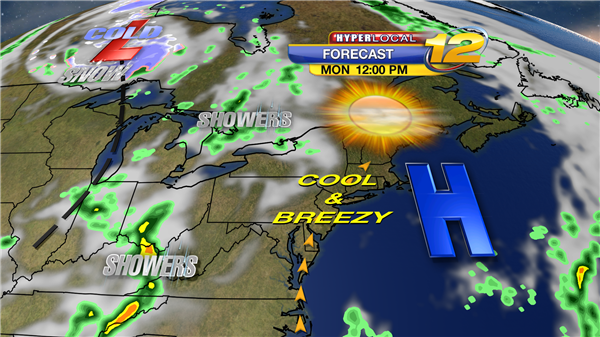 Today will be mostly sunny, breezy, and less humid with a high temperature near 70 degrees. 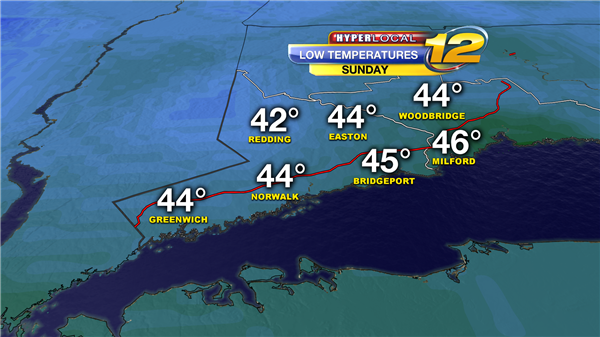 Tonight will be mostly clear and quite chilly with lows of 44 to 50 degrees. Tomorrow will be mostly sunny and pleasant with a high near 70. Wednesday will feature a mix of sun and clouds with a high of 69 and a low of 54. Thursday will be partly sunny with a high of 70 and a low of 54. Friday will be mostly sunny and warmer with a high of 75 and a low of 54.